Grenfell Tower: Theresa May, who was criticised for not visiting the scene quickly enough after the fire, privately met victims of the disaster [Image: Tang/Zuma Wire/Rex/Shutterstock]. What is the point in Theresa May privately admitting to survivors of the Grenfell Tower fire that Kensington and Chelsea Borough Council responded badly to the disaster, when the same council is still failing its people? Theresa May has privately told survivors and relatives of victims of the Grenfell Tower fire that the Conservative-led Kensington and Chelsea council’s response to the disaster was slow and flawed, and assured them that the tenant management organisation (TMO) would no longer be responsible for the rest of the estate. A Downing Street spokesman said the prime minister had acknowledged concerns about the Royal Borough of Kensington and Chelsea council and the Kensington and Chelsea tenant management organisation (KCTMO), which was responsible for the tower and surrounding blocks of flats. 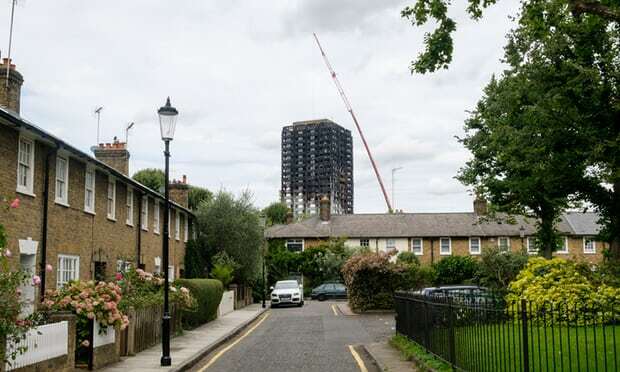 “She confirmed that the TMO will be removed from the management of the Lancaster West [Grenfell Tower] estate and she recognised that the council did not respond quickly enough after the fire,” the spokesman said. The prime minister was invited to the meeting by residents to hear about the challenges they continue to face, amid anger that a public inquiry will only look at the practical causes of the fire and not wider issues around the quality of social housing. That was published early yesterday (August 23). Later the same day, the Huffington Post reported on a meeting, possibly between some of the same survivors and KCBC representatives, in which the council was pilloried for its continuing failure to address survivors’ needs. Resident Cathy Cross said that Kensington and Chelsea, unlike other local authorities, is “very rich” and that it was time the council “upped their game”. She said: “When is this council going to actually house people. When is this council going to get kids out of hotels. When is this council going to take care of people’s mental health? “When is this council going to stop treating people with utter contempt, coming to these meetings and not having answers to questions, having senior managers who have to go across there and ask someone called Jim ‘where are our services?’ It is a disgrace. “When are you going to up your game? “When are you going to realise that when people have died that should be the worst thing you can do to your local citizens. “A woman who was suffering from PTSD asked the panel where the support services were for those needing help with their mental health… Robyn Doran, chief operating officer for Central and North West London Trust, said that there were pop up clinics being provided for the local area every day. But when there were shouts of “where”, the NHS boss was unable to name the locations and had to call for help from a member of her team. There were calls for more services to go to survivors living in hotels. Perhaps the most damning indictment was when Lancaster West estate resident Joe Delaney pointed out that the council’s “left hand didn’t know what the right hand was doing”, after revealing confusion over when the Tenant Management Organisation had been removed from responsibility over the estate. [Council chief executive Barry] Quirk said that the decision was made earlier this week, yet Delaney said he had been informed by TMO on June 22 that they had been removed from managing Lancaster West Estate. So, what was Theresa May really saying when she admitted that the council did not respond fast or well enough, if it is still failing residents? That the Conservatives in government and in Kensington and Chelsea Council are happy for the situation to stay that way? this Parasitic Murderer (PM) needs to suffer the same fate as Countess Elisabeth Bathory who was sealed up in a room by a wall with a small slot for food should anyone want to afford the witch such luxury, the countess murdered at least 600, this parasite has committed much worse atrocities!!! !